I love cleaning. There I said it. I know it’s probably not at the top of everyone’s favorite past times, but when I get into the groove of cleaning, I could go on for days. I love having my own apartment where I can tidy and pick up (or hide) all of my belongings. This past August marks a year of my boyfriend and I living in this apartment. Which completely meant that we needed to do a fall cleaning. 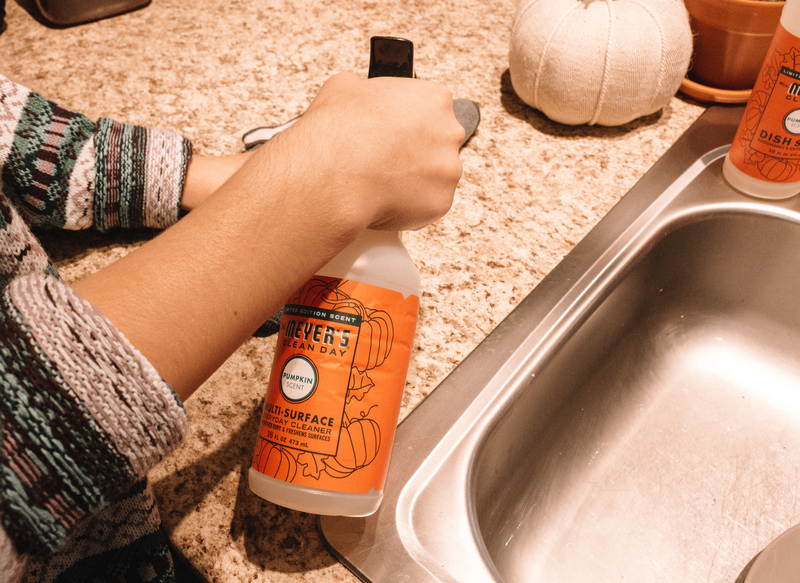 For Blogtober Day Five, I’m sharing my tips and tricks for making your fall cleaning successful! Just like having cute work out clothes motivates you to get movin’, fun cleaning supplies gets me in the mood for cleaning! I absolutely love The Grove Collaborative and the products that they sell on there. This is by no means an ad (I wish! ), I just genuinely love their products! If you sign up for The Grove with my link, you’ll get free products with your first purchase! If you don’t know what The Grove is, it’s an online website where you can buy eco-friendly, sustainable, good-for-you cleaning and household products. They sell brands that you may have heard of such as Mrs Meyers (my fav), Method, Dr Bronner’s and so much more. If you’re obsessed with fall like me, then you’ll love their products for fall! I am also obsessed with this walnut and cellulose scrubber sponge, I swear that it’s the best kitchen sponge I’ve ever used! It’s similar to a subscription box- where you get items every month. You’re able to pick your own products, skip months and shop in between boxes. I do 90% of my cleaning essential shopping on there and recommend it to anyone who listens! Why do a Fall Cleaning? 1. Because I’m in college, I tend to think of the beginning of the year when school begins. It’s the start of a new school year and I need to bust out my backpack and school supplies again. Having a clean and organized place helps me stay more organized for school. Regardless if you’re in school or not, think of fall as a way to start fresh for the end of the year! 2. Holidays and Events. Once September hits, there are countless fall activities and holiday parties you’ll be going to or throwing yourself! I would much rather spend a couple days deep cleaning everything once, then do it at the last minute before guests come over! 3. It lets you see what you actually need in the year. Accumulating stuff is a trait that must humans have in my opinion. Going through and cleaning everything allows you to see what never got moved the last time you cleaned. This may help you realize that you don’t wear purple (so stop buying it!) and help you gain more space in your home. 4. I’ve been guilty of adding things to my “I’ll get to that tomorrow list”. This is the time to get everything on that list done! Go through things, give away items, clean those baseboards you’ve been meaning to get to. This is such a great time to set aside a couple days and get to all those tasks. 1. Take everything out of the rooms and do a thorough vacuuming and dusting. 2. When putting everything back in the rooms, we did a deep cleaning of all the furniture. 3. Organized and went through everything as we went! It’s kind of crazy to see how much junk we had that was just taking up space in the closets. We ended up donating 6 bags of stuff! 4. Swept and mopped the floors. I do this regularly however I don’t usually mop under the couch and rugs! This was a great way to get everything all cleaned for the end of the year. 1. Under everything. Pick up and move everything! Clean under those rugs and vacuum under the beds! 2. Windows. Windows for me, tend to get neglected. I don’t think to clean inside the window frame that often, but it was gross enough to make me do it more often! 3. Closets. It’s much easier to keep adding to your closet, tucking away those clothes you never wear. This is the time to pull everything out and go through it as you put it back in. 4. Cabinets. Now be honest, how often do you empty cabinets and clean them? Probably not too often! 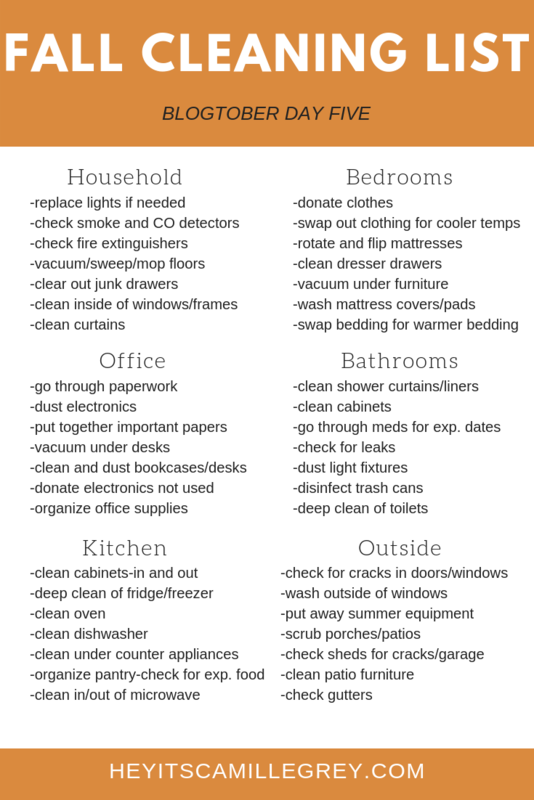 I’ve provided you guys a fall cleaning list to help you stay organized with your cleaning! Check out my Blogtober Day Four post here! I will definitely be using that fall cleaning list!!! Yay! I’m so glad that it was able to help you! Yay im so glad it could help you! This is great, I especially like the list of things broken down and organized. I needed that! 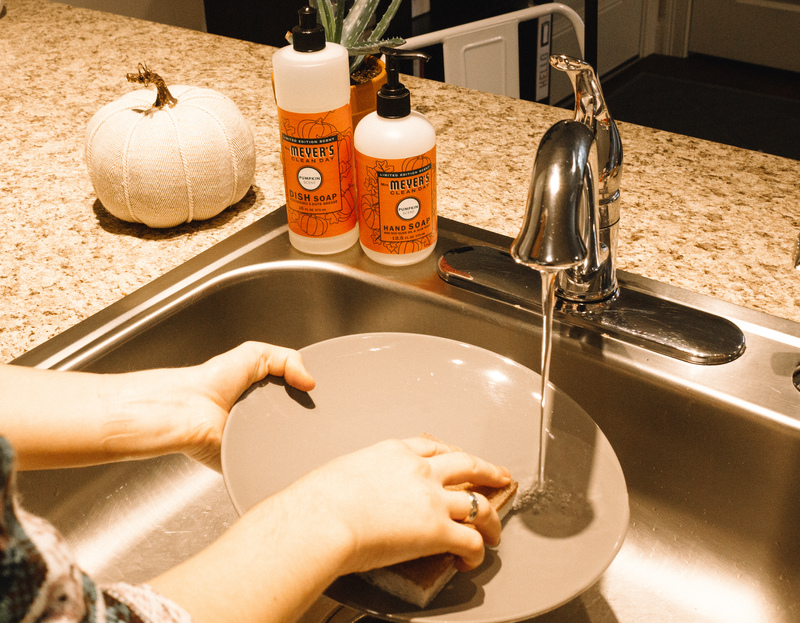 In my search for fall cleaning inspiration, I came across this blog (https://www.greatplainschemdry.com/dirty-things-you-touch-everyday/) that talks about just how dirty things can get around the house. Made me really want to clean, and in my search for the best way to do so, I came across your blog here. Thanks, again! I’m going to use this list and GET STUFF DONE! OMG I just read that article!! Now I’m going to spend the rest of the day deep cleaning everything! I’m so glad that my post is able to help you!